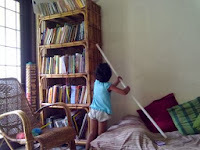 When I saw that she was almost done, I asked her ‘Hi kannamma, what are you doing?’ She said ‘Come, I’ll teach you a game! I’ll hold the pipe, and you drop a pair of earrings with hooks at the top. If they both get hooked together when they come down, you get a point.’ I said ‘Ok!' and dropped them together once, and yes, they did get hooked together. She said 'One point! Do it again. Each person gets two chances.' The second time, they didn't get hooked together. She said 'One more point! So, you have two points now.' I said 'But, they didn't get hooked together!' She said 'It doesn't matter. You get a point every time you drop it.’ (I love how rules get made up and changed as the game goes along. :) And we played this win-win game for a while. 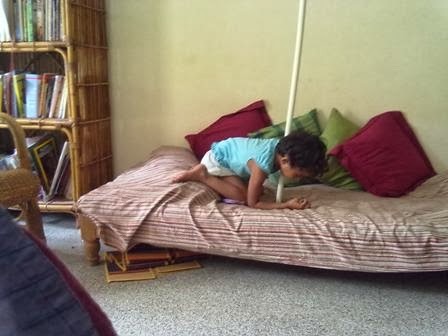 I have no idea what my little scientist was upto. But I know that it was something immensely meaningful and joyful to her. 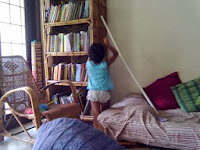 It is very unlikely that she approached / initiated it as a ‘learning activity’. She was just AT IT, clearly engrossed in her exploration, lost in time. As I sat there, unschooling my mind and healing through my scars of being told (as a child, mainly by teachers in school) and watching many children being told repeatedly 'Don't waste your time. Come study'. 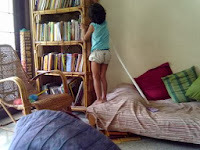 This blogpost is dedicated to my friend Jinan, who taught me how to let children be, observe them and learn from how they learn. You can read about him and his work in these sites. 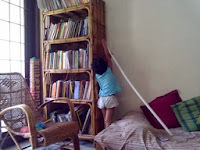 Sangeetha, am unable to get in to the link that you have mentioned? Is it working? Maha, I just saw that it isn't working. Thanks for bringing it to my notice. Will find the correct address and replace it asap.